Sometimes, you just can’t hold back. Any gap in conversation is a potential song break. Every birthday is a chance to ask for more theatre merch. This is what it means to be incredibly stagey. You eat, sleep and breathe theatre. Maybe you perform, you work in stage management, you’re a writer, director or just the biggest fan there ever was, but here are 11 times you were probably extra theatrical. 1. Getting Hamilton tickets the day they were released. You thought you could handle it but it’s too much. You’re going to be in the room where it happens. 2. When you and a friend both finally win the Dreamgirls ticket Lottery. Swipe to buy! SWIPE TO BUY! 3. You’re always the one to shush other people in a theatre. 4. Whenever you fall or trip, you can always style it out no matter what. Years of stage combat lessons mean you know how to trip like you planned it. 5. 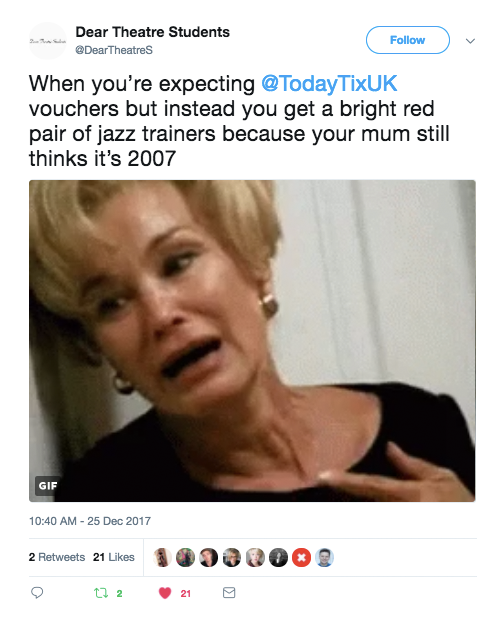 Your family and friends get you the tickets you’ve been not-so-subtly hinting at for months and you have to pretend to be surprised. 6. You have no problem going from dress rehearsals to the pub in full hair and makeup. It doesn’t matter whether you’re the romantic lead or you’re playing a dirt-covered villager, you’ve got a pint to order then a train to catch. 7. Someone says ‘Hello’ to you and you respond with ‘My name is Elder Price’. 8. Scrolling Twitter to find hints of which performers might be popping into the Theatre Cafe is a daily habit now. 9. You never understood why people didn’t like Rachel Berry on Glee. She dated the quarterback, had a killer voice, was the lead in most shows and her mum was Idina Menzel. Ahhhhhh OK.
10. People often catch you working show lyrics into everyday conversation. 11. When your Twitter is as theatrical as you are. It helped you find an online stagey community and they’re amazing, wonderful people who get all your Phantom jokes.